This ultimate custom sports bag is made of 420d nylon dobby. Offers exterior insulated bottle holder for easy access. Spacious main compartment with front zippered pocket and side mesh pockets provide added storage. Maximum imprint or embroidery area is front pocket center or back panel center 3.5" diameter. Colors: Red/Black (6885), Royal/Black (6886), Gunmetal/Black (6887), Sunburst/Black (6888). If you want to make custom Ultimate Sports Bag with your logo,slogan,telephone,website,email , please send us your design or give us instructions about your imprint.We'll send a free virtual art proof for your approval,you can ask a real sample with logo before production too. 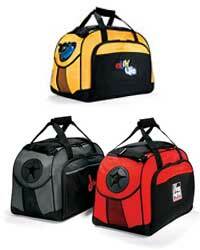 Our Ultimate Sports Bag is popular as promotional,advertising, business,corporate gifts.